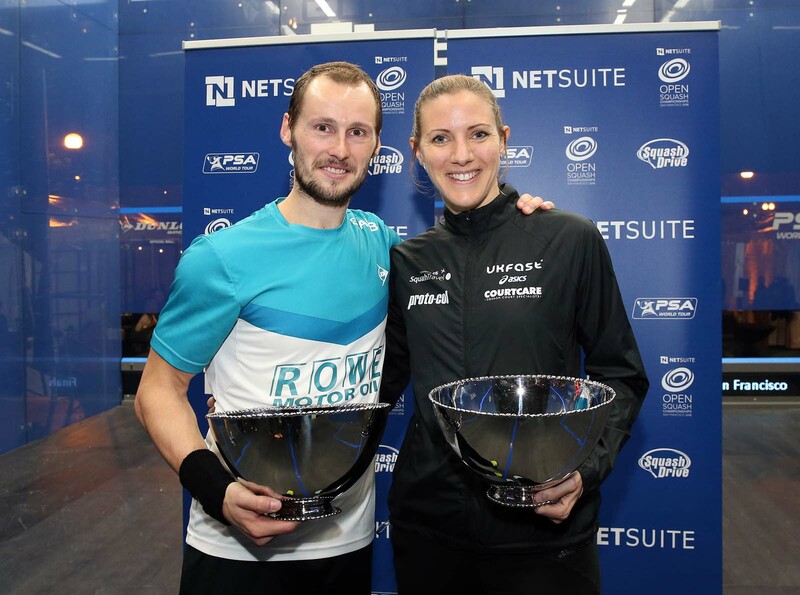 Men’s World Champion Gregory Gaultier and Women’s World No.2 Laura Massaro claimed the 2016 NetSuite Open titles after they defeated former World No.1 James Willstrop and United States No.1 Amanda Sobhy, respectively, in San Francisco. Gaultier, a winner here in 2012 and 2014, had been in sublime form throughout the week and reached the final without dropping a game, before exhibiting some of his best squash against Willstrop to go two games ahead on the spectacular glass showcourt on Justin Herman Plaza. World No.19 Willstrop battled back and held three separate game balls throughout a tightly-contested third game, but the Englishman ultimately lost out on the tie-break, with Gaultier wrapping up an 11-9, 11-2, 14-12 victory to lift his first PSA World Tour title of the season. "I’m really happy with the way I’ve been playing this week, I’ve been playing better day after day," said Gaultier. "It’s really nice to see James back playing and being well after the 2/3 years he had struggling with hip surgery. I saw him play against [Simon] Rösner [in the quarter-final] and it was fantastic to see him back playing. "The first time we played each other we were playing in the British Junior Open when we were about 15 or 16 years old. I remember we had this brutal match in the final so it’s been a long time, but it’s good to see our generation reaching the top after so many years." The Women’s final saw Massaro come up against defending champion Sobhy, who triumphed over Massaro’s compatriot, Sarah-Jane Perry, to take the honours at the inaugural Women’s event last year. It was the Englishwoman who found her length the fastest, taking the ball early to build up a strong rhythm of hitting and she triumphed in a comfortable opening game for the loss of four points, before a strong reaction from World No.6 Sobhy saw the Harvard graduate level the scores in game two. Massaro got her herself back in front in the third though and moved her opponent around the court well to restore her one-game cushion. 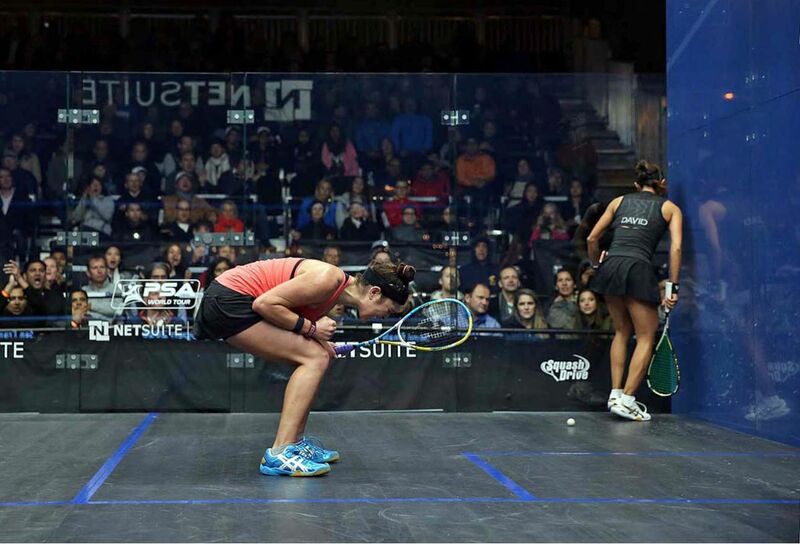 Sobhy put up a real fight in the early stages of the fourth game, but an indomitable Massaro was just too strong and feathered in a forehand volley drop on her first match ball to triumph 11-4, 9-11, 11-8, 11-7 and earn a share of the $50,000 prize purse, which is double the amount that was on offer last year. "I’m really happy to get my hands on the title," said Massaro. "I don’t know how many more years I’ll be playing for it and Amanda is such a good talent coming up, so I’m glad that I managed to get one more win. "The Tour on the women’s side is perhaps the strongest it’s ever been and it’s a great time to be part of women’s squash because of the parity that’s going on with the men. We all work really hard and I absolutely love playing in front of the crowd in iconic settings just like this. It’s an absolute privilege to play on this court and to get my hands on another title." 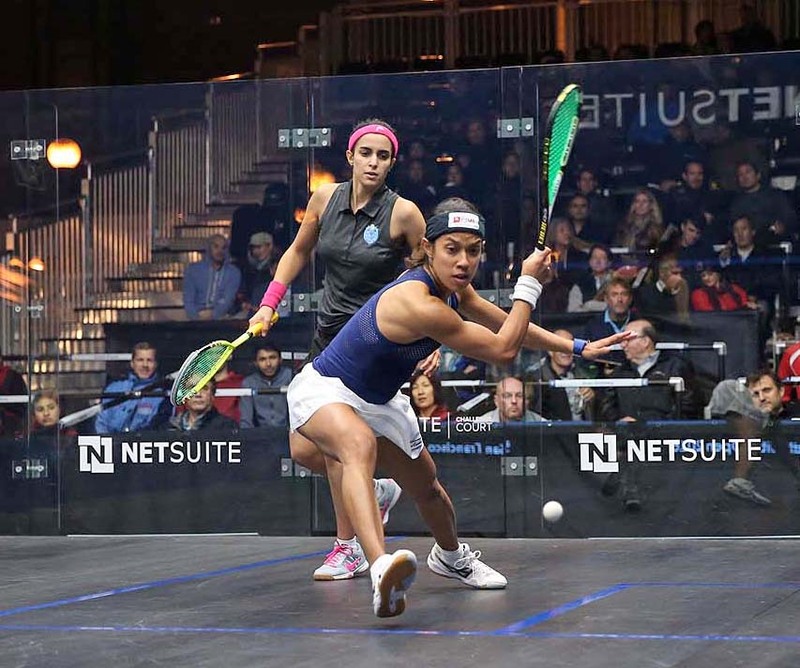 United States No.1 Amanda Sobhy will compete in the final of the NetSuite Open, PSA W50 tournament for the second year running after overcoming eight-time World Champion Nicol David in the semi-final stage of the 2016 edition in San Francisco. The defending champion went a game down early on after a fast start from David saw the eight-time World Champion mix up her game to edge it on the tie-break. But Sobhy soon began to dominate and took the next three games to earn a first ever win over the Malaysian. "Everything just clicked today, she’s a phenomenal player and I have the utmost respect for her," said Sobhy, who will take on England’s Laura Massaro in the final. "I knew it would be a battle, I just wanted it to be a fair match and for both of us to play our best. I lost the first game, but I knew I was right there in it and I just told myself to stay positives and I’m really happy that I was able to do that because I won. "I had a seven-week training block this summer, which I’ve never done before in my entire life, so it’s really nice to see it all pay off and I’m looking forward to tomorrow." Former World No.1 James Willstrop and World Champion Gregory Gautier will battle for honours in the Men’s PSA M100 final after they rose to respective wins against Diego Elias and Marwan ElShorbagy. On the spectacular glass show court housed on Justin Herman Plaza, Willstrop played some of his very best squash in a ruthless display as he dismantled 19-year-old Peruvian Elias, with the pinpoint accuracy and intelligent shot selection that were the bedrock of his rise to World No.1 in 2012 in full flow. The Yorkshireman romped to an 11-5, 11-3, 11-6 victory in 39 minutes to reach his biggest final since the Kuwait PSA Cup in 2013. "It’s been a long recovery and you don’t know if you’re going to reach that level again," said Willstrop, who has struggled with both a hip injury and illness over the past three years. "I think the key is that I love playing squash and I’ve always found a great sense of enjoyment on the Tour, probably more so now then at any other time of my career. "It’s great to be back in a major final like this and it’s good to know that it’s still in the bank." Gaultier, a winner in 2012 and 2014, was on the front foot from the outset and quickly sailed into a two-game lead against an out of sorts ElShorbagy. The third game was a much closer affair as ElShorbagy finally found his length, only to see Gaultier ultimately take it on the tie-break to wrap up an 11-3, 11-7, 14-12 victory. "I’m glad I got my speed back, I’ve been struggling this month and I wasn’t feeling great," said Gaultier. "I managed to find motivation again because I had a bit of a break at home. I tried to stay positive mentally, I’ve had a lot of friends helping me out to lift me back out when I was down. I’m happy with the way I was moving again." 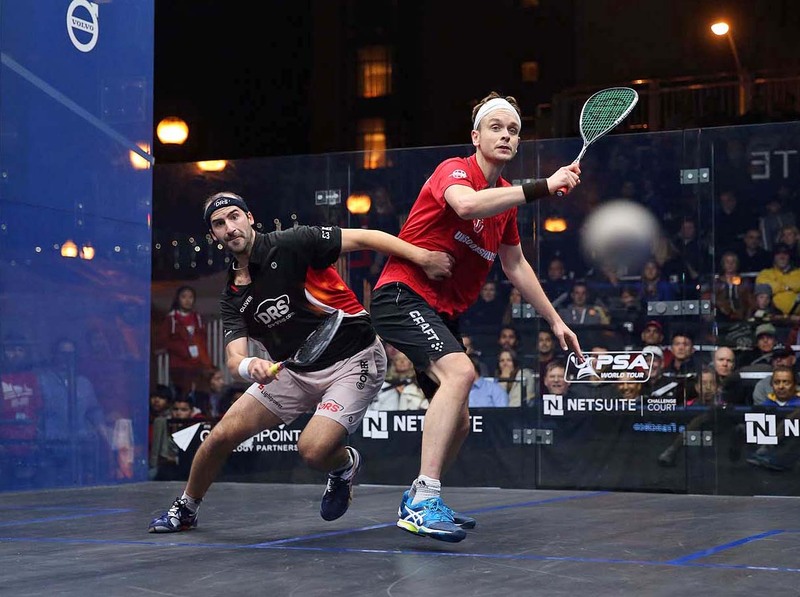 Former World No.1 James Willstrop produced a superb comeback to overturn a two-game deficit and eliminate Germany’s Simon Rösner in the quarter-final stage of the NetSuite Open, PSA M100 tournament taking place on San Francisco’s Justin Herman Plaza. The Englishman looked down and out after Rösner opened up a two-game lead, but tournament wildcard Willstrop dug in superbly and used all of his 17 years of experience to battle back, taking three games without reply to earn a 9-11, 9-11, 11-9, 11-2, 12-10 victory. "I think the quality of the squash was so good," said Willstrop. "It was a pretty high standard, we were both hitting the ball accurately. It’s cut-throat stuff, the ball was flying around and you have to have such control to stay in it. His pace and control was a little bit better in the first two games. "He won the crucial points in the second, but it was close. The key is that I didn’t panic, it’s a difficult psychological deficit to overcome when you’re 2-0 down. The statistics show that people don’t do it often, so I just had to keep making him play and I knew that I might be able to find a way in." Two-time World Junior Champion Diego Elias will meet Willstrop for a place in the final after a clinical showing saw him overcome Frenchman Gregoire Marche. The fixture featured a clash of styles, with Marche’s all-action style contrasting with the languid one of Elias, and it was the latter who rose to a two-game lead courtesy of some intelligent court craft and fine winners. Marche had beaten three-time World Champion Nick Matthew in the previous round, but was frustrated time and time again by the prodigious talents of Elias, who wrapped up an 11-8, 11-9, 11-4 triumph in 40 minutes. "I’m really happy, it’s my first win on SQUASHTV," said Elias. "I was focused, I wanted to enjoy the match and I played my best. It has been an amazing experience, I knew the court was a bit tricky, but I’m happy I was able to play well on it. "I had so much fun and wanted to thank everyone for supporting me." 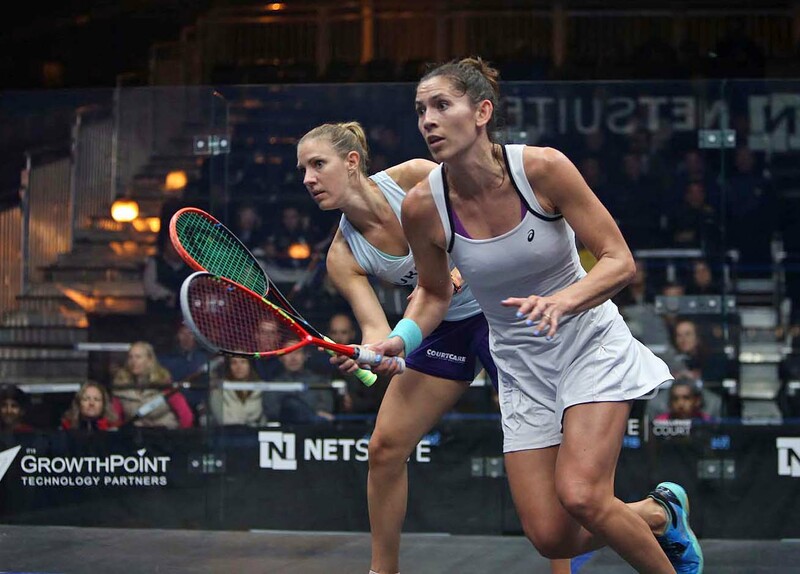 In the Women’s event, World No.2 Laura Massaro became the first finalist after overcoming New Zealand’s Joelle King in an imperious display from the Englishwoman. Preston-based Massaro overcame a strong start from King to record a 12-10, 11-5, 11-4 win, ensuring she will lock horns with either eight-time World Champion Nicol David or home hero Amanda Sobhy, who play tomorrow, in the final. "I was way down in that first one, and I think it just shows that if you’re not completely focused, then her skills are just too good, so it was about making sure that I was 100 per cent focused on the game plan that I set out before," said World No.2 Massaro. "Being able to stick to a game plan is probably one of my biggest strengths and as long as I do that, I’m happy win or lose, so that’s my only focus when I’m on court." 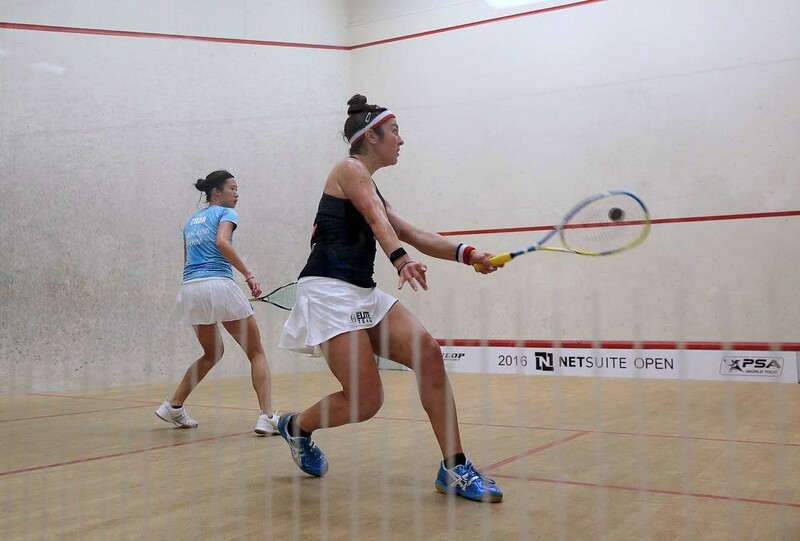 Defending champion Amanda Sobhy moved to within one win of a second successive NetSuite Open final after defeating Hong Kong's Joey Chan in straight games in the quarter-final of the PSA W50 tournament held in San Francisco. The United States No.1, who overcame England’s Sarah-Jane Perry in last year’s final, was in fine fettle throughout the fixture and recorded an 11-3, 12-10, 11-2 victory to reach the last four. "I’m happy to get off in three today, I can conserve some energy for the semi-finals on Friday," said Sobhy. "It’s nice to be back here playing and I hope to defend my title and keep it on home soil. [Playing in front of a home crowd] helps tremendously, I love playing at home and having all the supporters around the country rooting for me. "It’s amazing and being in San Francisco is great, the crowd is spectacular. There are so many people that I don’t know, but who are here supporting me, the support has been amazing." Sobhy will go head-to-head with Malaysia’s eight-time World Champion Nicol David in the semi-final after the former World No.1 overcame Egypt’s Nour El Tayeb. David adopted a high ’T’ position from the outset to cut off El Tayeb’s threat at the front of the court, and went two games up after coming out on top of a series of entertaining rallies. But the court, which was housed on Justin Herman Plaza, had become slippery throughout the night due to adverse weather conditions and El Tayeb, who had suffered falls on more than one occasion, felt that she couldn’t carry on, bringing a premature end to the fixture. "There are some patches that may feel a bit funny, but I felt alright on the court," said David. "It’s just a matter of how comfortable you are after falling, you don’t want to stretch yourself, so it’s not the nicest way to win it. I hope she’s okay and didn’t hurt herself along the way. "You try your best to do what you can under the circumstances. We’re both going through the same situation, but you just have to see what works for you and make the most of it as much as you can. It’s great to be here in San Francisco, I’m playing here for the first time. I’m looking forward tomorrow, but it’s not the best way to win this match." Top seed Laura Massaro will join Sobhy and David in the last four after she stormed past compatriot Victoria Lust in her quarter-final fixture. 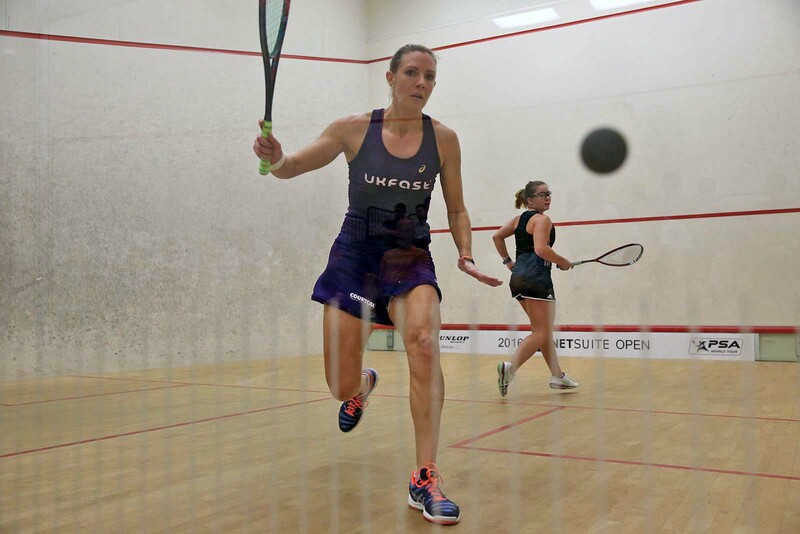 Massaro, who beat United States No.2 Olivia Blatchford in the previous round, was on the front foot from the outset and powered to the victory by an 11-3, 11-7, 11-9 margin. "I’m pretty happy with that, as I said yesterday the court conditions are tough being on the back court because the rallies are a little bit longer," said Massaro. "But I’m happy to be off in three and I’m looking forward to getting on the glass court tomorrow." New Zealand’s Joelle King was the other player to triumph on day two of the Women’s event and she dispatched Egypt’s Heba El Torky to set up a semi-final clash with Massaro. In the Men’s PSA M100 tournament, World Champion Gregory Gaultier sealed his place in the last four courtesy of a 3-0 win against Australian No.1 Ryan Cuskelly. Cuskelly played well in patches, but Gaultier’s unflinching physicality saw him brave the slippery court, taking three games in a row to set up an encounter with Egypt’s Marwan ElShorbagy, who beat Cameron Pilley. "I was really looking forward to this match, I haven’t played Ryan for a long time," said Gaultier. "He is really tricky and he has really good hands, so I had to impose my pace and the conditions were cold, so I had to be on my toes with his tricky shots. I tried to stay positive because I’ve had a bit of a nightmare this season with injuries. In my career, I’ve done everything I wanted, so every time I step on court it’s all a bonus." 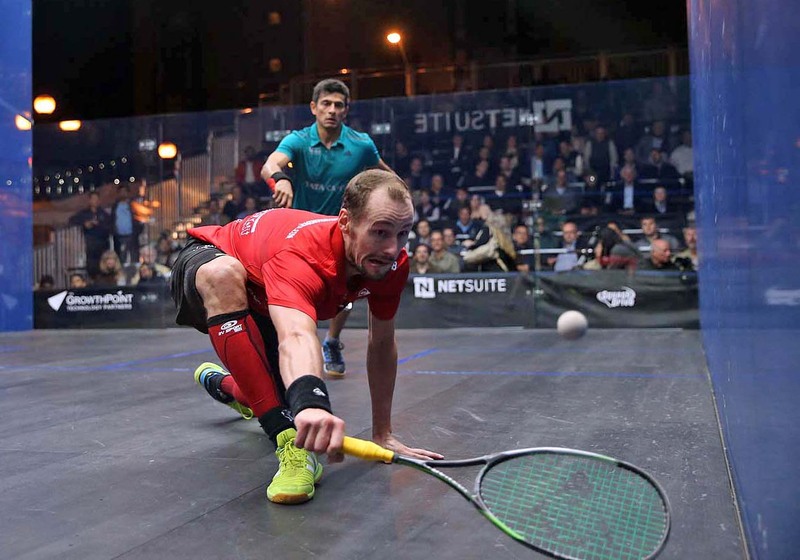 ‘Colombian Cannonball’ Miguel Angel Rodriguez and three-time World Champion Nick Matthew slumped to surprise first round defeats on the opening day of main draw action at the 2016 NetSuite Open, losing to former World No.1 James Willstrop and French World No.29 Gregoire Marche, respectively, in San Francisco. Rodriguez’s match with Willstrop was due to be held at the glass show court on Justin Herman Plaza, but, with the scores locked at 3-3 in game one, a rapid change in temperature meant that the court became too wet and slippery to play on. After a short delay, the match was moved to the Bay Club San Francisco, where Willstrop’s unparalleled accuracy and intelligent shot selection saw him take the match in straight games to leave Rodriguez without a win so far this season. "It wasn’t the match either of us wanted, we wanted to be on that big stage tonight," said Willstrop, who will face Simon Rösner for a place in the last four. "The difference the courts over there [Justin Herman Plaza] and here is a million miles. If we had both written down a game plan before, it would have completely changed. It’s like going from clay to grass, that’s the situation we had, so it’s an interesting challenge and we had to get our heads round it. "I had to break up the pace and stick with it, because you can’t win rallies easily on this court. The ball sits up, it’s bouncier and he gets every single ball I throw at him, so it’s an almighty challenge to win a rally off him. I had to be very patient." 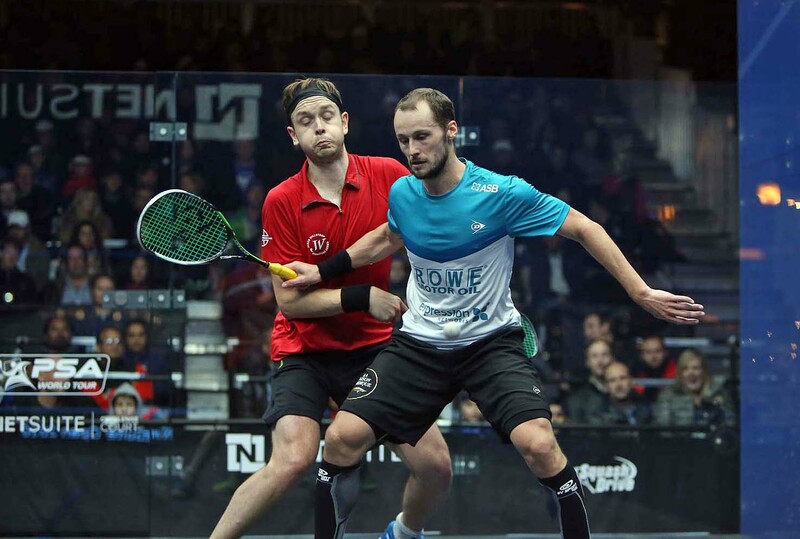 Elsewhere, last year’s runner-up Matthew was making his first PSA World Tour appearance of the season, while Marche had won his biggest ever Tour title just three weeks previously at the Open International de Squash de Nantes. And the difference in match fitness between the two showed as a fine display from Marche enabled him to power to an 11-5, 11-3, 11-8 victory in 43 minutes to set up a quarter-final clash with Peru’s Diego Elias. 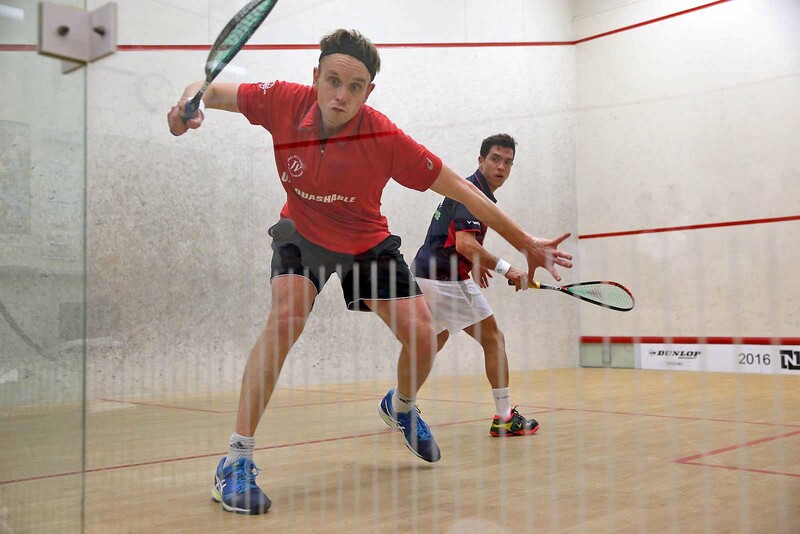 "It’s not the result I wanted, but I’m delighted to be back on the PSA World Tour at the NetSuite Open," said Matthew. "I came up against a sharp opponent. I have to keep working hard and working smart to get back to the level I want to be at. "I’m confident I will get better as the season goes on." Peruvian two-time World Junior Champion Elias also caused a big shock on day one, with a sensational come from behind victory over Egyptian World No.10 Ali Farag. 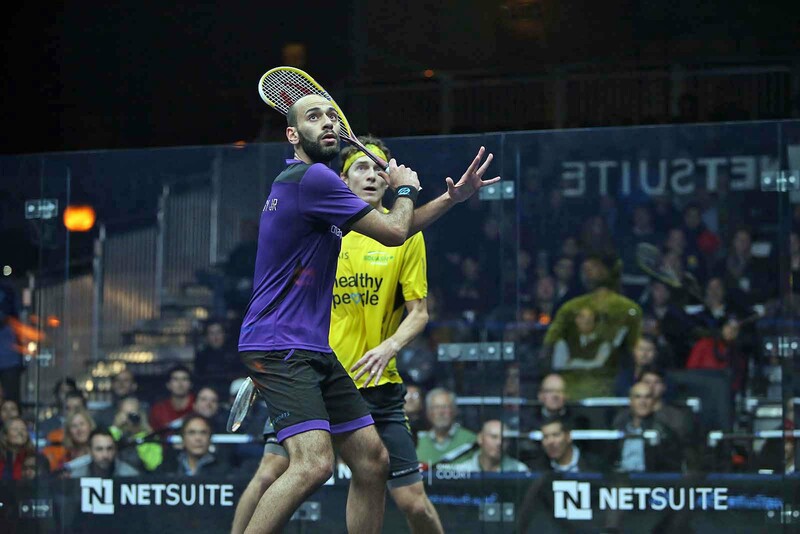 Coming less than a week after he reached the final of the Al Ahram Squash Open NEWGIZA in front of the iconic Great Pyramid of Giza, Harvard graduate Farag looked to have carried his fine form into San Francisco after nullifying Elias’s attacking threats to go two games to the good. But Elias responded brilliantly and the World No.34 took advantage of a tiring Farag to battle to an an extremely hard-fought 8-11, 6-11, 11-7, 11-9, 11-7 victory. "I felt so good on court and I'm so happy to get the win,” said Elias. World Champion Gregory Gaultier will take on Australian No.1 Ryan Cuskelly in the next round after respective wins over Saurav Ghosal and Max Lee, while Marwan ElShorbagy and Cameron Pilley will face off in the other quarter-final. The Women’s event saw United States No.1 Amanda Sobhy book her place in the last eight courtesy of a victory over English qualifier Fiona Moverley. The match featured a series of quick-fire rallies as both players took a game apiece, before Sobhy moved on to wrap up the win in four and set up a quarter-final meeting with Hong Kong’s Joey Chan. "She was hitting winners left and right, especially on her backhand side so I just dug in and stuck to my game plan. I’m happy to win." World No.2 Laura Massaro is through after beating Sobhy’s compatriot Olivia Blatchford and she will take on compatriot Victoria Lust in the quarter-final. Malaysia’s eight-time World Champion Nicol David and fourth seed Joelle King were also winners, setting up respective fixtures with Nour El Tayeb and Heba El Torky. 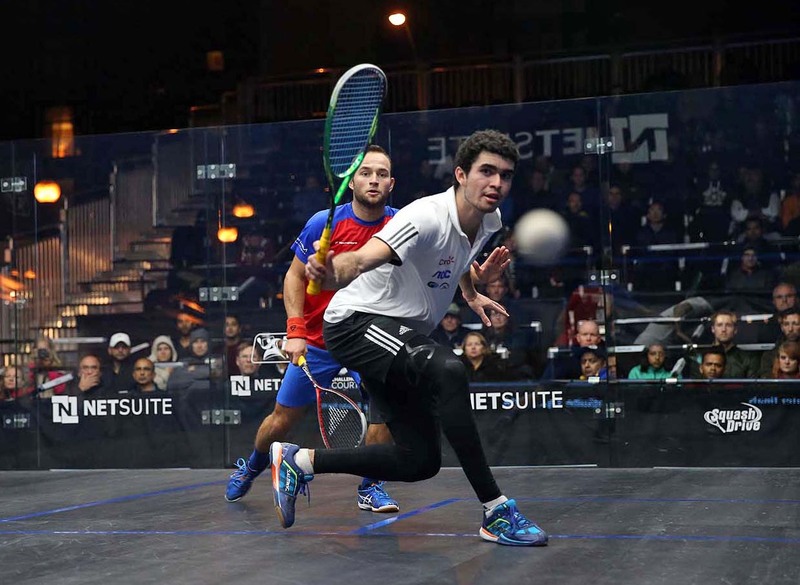 Peruvian World No.34 Diego Elias and Qatari World No.42 Abdulla Mohd Al Tamimi overcame higher-ranked opposition in the final qualifying round of the NetSuite Open to reach the main draw of the PSA M100 tournament taking place in San Francisco, United States. World No.34 Elias, a two-time World Junior Champion, came up against England’s Tom Richards in his fixture, with 30-year-old Richards ranked eight places above Elias in the World Rankings. 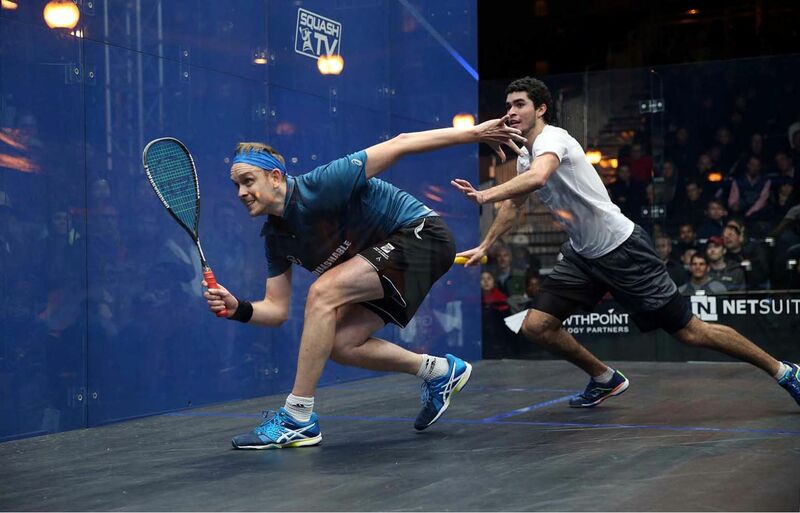 But an apparent injury to Richards after the opening game saw him struggle with his movement, and Elias picked him off to record an 11-5, 11-3, 11-1 triumph in 35 minutes, setting up a main draw clash with Egypt’s Ali Farag, who reached the final of the Al Ahram Squash Open NEWGIZA last week. "The first game was very tough and long," said Elias. "I think something happened, maybe he picked up an injury because he wasn’t the same. But I’m happy with the win and to feel well on court. "It’s the first time I’ve played here, I got injured a week before the tournament last year so it’s great to reach the main draw. I’m very happy to be here. I didn’t think ahead to the main draw because I was focusing on getting through qualifying first. I don’t care who I face, every match is going to be hard." Al Tamimi, meanwhile, secured his main berth courtesy of a fine win over World No.36 Adrian Waller in straight games. The 21-year-old, who has three PSA World Tour titles to his name, will take on World No.12 Simon Rösner for a place in the last eight. Frenchman Gregoire Marche and Switzerland’s Nicolas Mueller were the other victors on the final day of qualifying after they achieved respective wins against Alan Clyne and Cesar Salazar. Marche will lock horns with last year’s runner-up Nick Matthew in the next round, while Mueller will line up against World No.7 Marwan ElShorbagy. Elsewhere, all of the top four qualifying seeds in the Women’s event made it through to the main draw unscathed, with former World No.5 Low Wee Wern banishing the injury demons that have dogged the last 18 months of her career to defeat England’s Alison Thomson. "I’m feeling great to be able to be back on court again. To be honest, it feels a bit weird to be playing in the qualifying, I haven’t done that in a long time. But it’s good to get two matches in and to get to the main draw again. Low is set to face Egypt’s World No.12 Nour El Tayeb in round one, while Fiona Moverley, Samantha Teran and Sarah Cardwell also rose to victories. Moverley and Teran will meet United States No.1 Amanda Sobhy and Heba El Torky, respectively, while Cardwell will clash with England’s Victoria Lust. Eight-time World Champion Nicol David and 2013 World Champion Laura Massaro will be the star attractions at the 2016 NetSuite Open when the tournament, which has doubled prize money year-on-year, gets underway in front of San Francisco's Oakland Bay bridge and Ferry Terminal on Tuesday September 27. David and Massaro, two of the most successful female players of all time, will be joined by the likes of New Zealand's Commonwealth Games Medalist Joelle King and home favourite Amanda Sobhy, the Boston-based 21-year-old Harvard-gradute and defending champion ranked No.8 in the world, at the event which takes place in a specially constructed outdoor arena on Justin Herman Plaza. Massaro, who held the World No.1 ranking from January to April this year, will face American number two Olivia Blatchford in the first round while David, who topped the World Rankings for an unprecedented nine years from 2006-2015, will open her campaign against local wildcard Reyna Pacheco – a Mexican immigrant who discovered the sport via an Urban Squash programme in San Diego. “Having committed to doubling the prize money available at this year's Women's tournament we are pleased to see that some of the biggest names in women's squash will make their debuts in San Francisco next month,” said Tournament promoter John Nimick. “The likes of Nicol David and Laura Massaro are up there with the most successful female players of all time and have lit up squash courts all over the world with their exploits. Their presence at the tournament will serve to help inspire everyone involved in the local squash community. A total of 28 players from 14 countries will compete across the tournament, with qualification starting on Sunday September 25 at the Olympic Club and the Bay Club San Francisco. 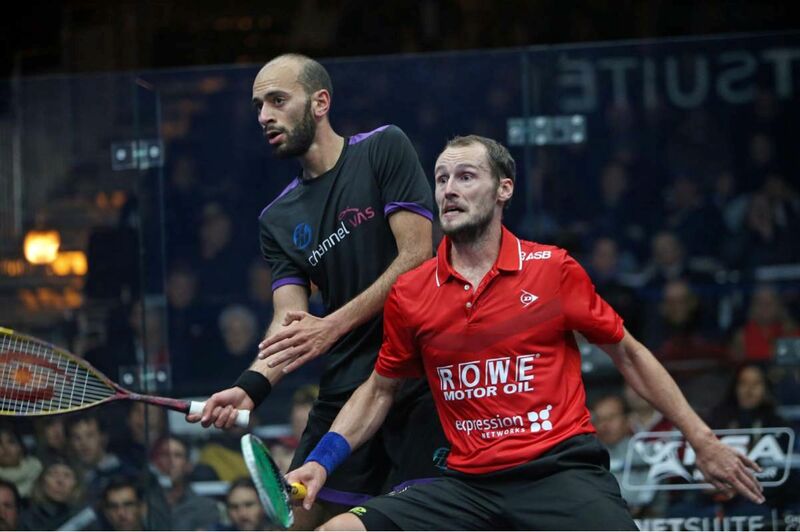 In what promises to be a compelling battle for the title, 2014 winner Gaultier will be hoping to regain the silverware ahead of a field that includes seven of the world's top ten players – with 14 nations in total represented in the draw. “We are delighted to have so many of the world’s top players competing in the 2016 NetSuite Open in what looks certain to be one of the most competitive and entertaining editions of the eight-year-old PSA Tour championship,” said tournament promoter John Nimick. “While we are very fortunate that players like Gaultier, Matthew and James Willstrop have made San Francisco a regular stop on their schedules, we are equally excited to welcome some of the most talented up-and-coming players in the world this year to create a draw that will have West Coast fans packing in around the all-glass NetSuite Challenge court once again.